← Welcome to the “New & Improved” TheVodkaParty! 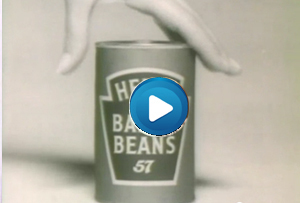 Mad Men season 5 has revolved around the elusive hunt for Heinz Beans as a new client. 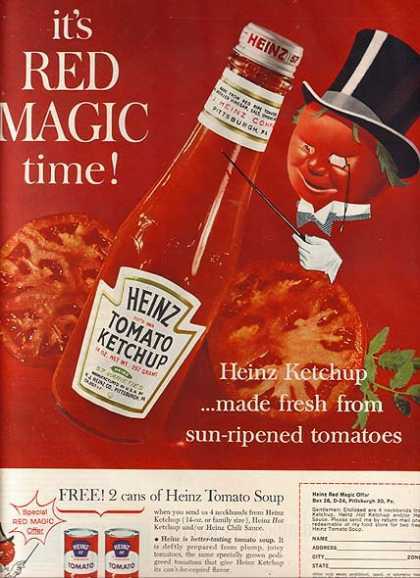 But did the Ketchup king need the creative magic of SCDP to bring the beans campaign to life? Or were they getting along fine without them? 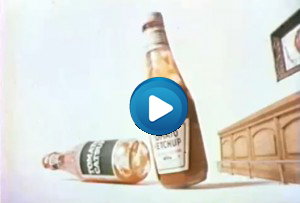 You be the judge with this collection of classic Heinz print and TV ads from the 60s. 1960 – Heinz starts the decade by slathering a magnificent steak with the slow-moving red stuff. 1960 – In a creep hangover from a theme Heinz introduced in the 30s, we we the “Red Magic” resplendent in top hap. 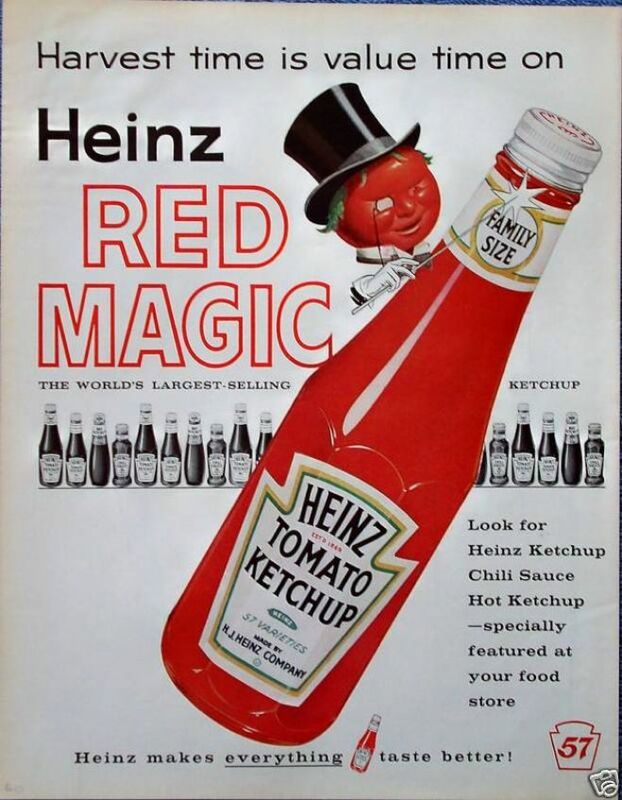 “Red Magic” seems an odd consumer marketing theme for the the 30s, when Americans experienced a major “Red Scare” with the fear of Soviet infiltration), or the 60s when the “Red Menace” of the Soviet Union and People’s Republic of China where the bogeymen of the day. 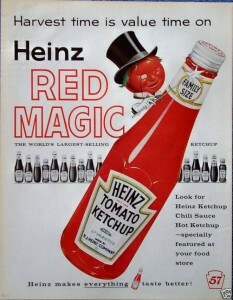 1962 – Red Magic makes perhaps his final appearance in the year that also saw the Cuban Missle Crisis. 1963 – Heinz returns to the real world to show actual consumers of their product (Burger Eaters) and go for an effective social proof argument (more of them insist on Heinz). 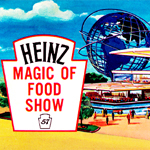 1964 – Heinz Magic of Food Show booklet from the 1964 New York World’s Fair. The show was performed in the “Festival of Gas Pavilion.” Really. Click image to view booklet in new window. 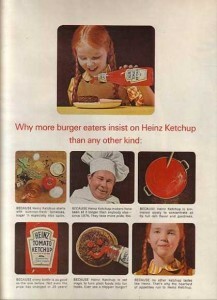 1965 – Mid-60s Heinz Beans advert from the UK. 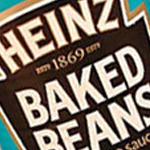 While Heinz Beans never gained dominance in the US, in Old Blighty, Beanz Meanz Heinz. 1965? 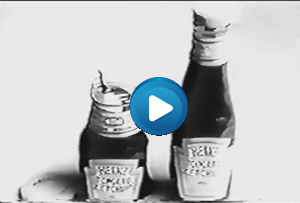 – Mid-60s TV spot by Doyle Dane Bernbach (the same guys who called the VW Beetle a lemon). 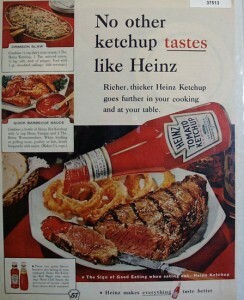 The TV-Western references and the fact it’s in color probably places this around 1965 or 1966. Not bad stuff and any client should think twice before dropping DDB for SCDP. 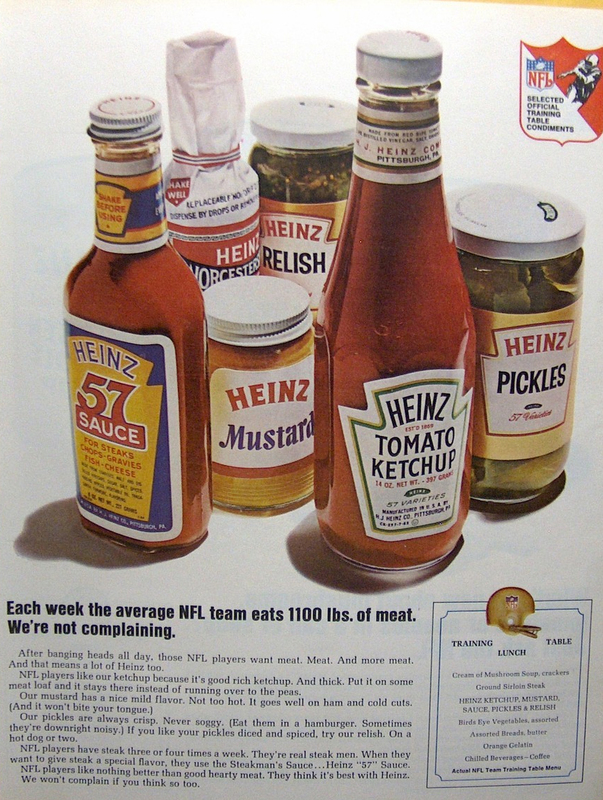 1966 – By now Heinz was supporting the NFL. 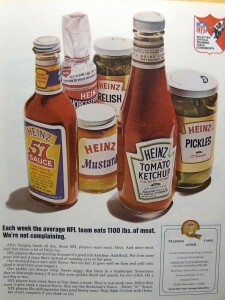 The 1,100 lbs of meat eaten weekly by the average NFL team were presumably dripping in Heinz condiments.